My main telescope is a 12'' LX200. I use it in both Alt-Az (with the de-rotator) and equatorial mode. While the de-rotator introduces very severe vignetting, for targets that are small enough it's quite nice to use: i can forget about drift aligning and guiding is easy. Also, the scope is much more stable in this configuration, and there is very little vibration. 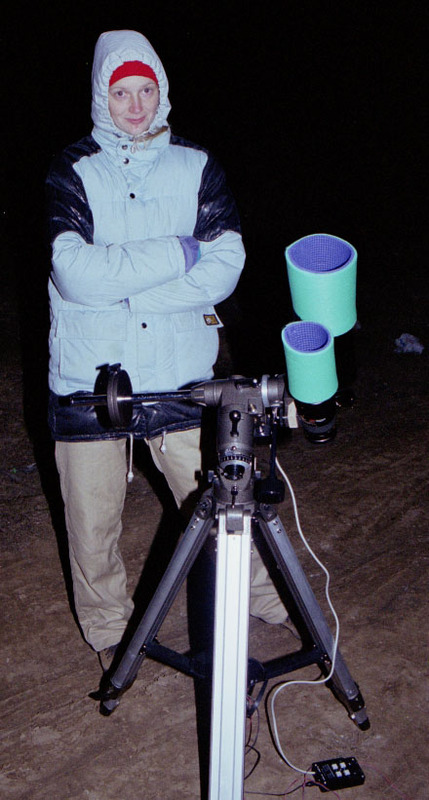 Around the beginning of May 2001, i installed an equatorial pier, so i begun to taste the delights of polar aligning. This is how it looks like (myself included). The camera i use is a Nikon F2. I focus using a 12X loupe on a matte screen (C type). I guide manually (using a GEG). While slightly boring, manual guiding has the advantage that it shows in a very direct way how everything is working. I can evaluate seeing, telescope vibration, the effect of wind etc. For wide field images, i use a CG4 equatorial mount, on which i put the Nikon (and usually the 180/2.8 lens) and a 90mm f/5.6 Orion Mak for guiding. Here is a picture of that, together with my trusty assistant (my wife Andreea). I scan the negatives with a Minolta Scan Dual II film scanner. After making the first prototype of the cpx3m camera, i didn't take any new film pictures, mostly because my main interest now is in photometry. 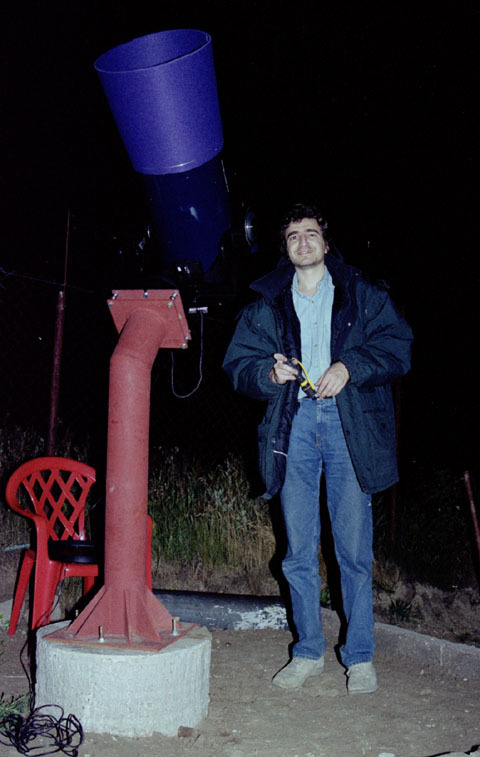 My main observing site is 40km NNE of Bucharest, in a village called "Gradistea". Transparency is fair on most nights, so that a 1-hour exposure on unhypered LE400 at f/10 shows just the faintest trace of fogging (i can only see it on scans - the negative looks transparent). Fogging begins to be visible on the negatives after 50mins at f/6.3. All the above is true for the higher elevations. As there is significant local light pollution, i cannot take pictures below 30-40 degrees to the south.